Pelicans near the Queen Isabella Bridge in Port Isabel. 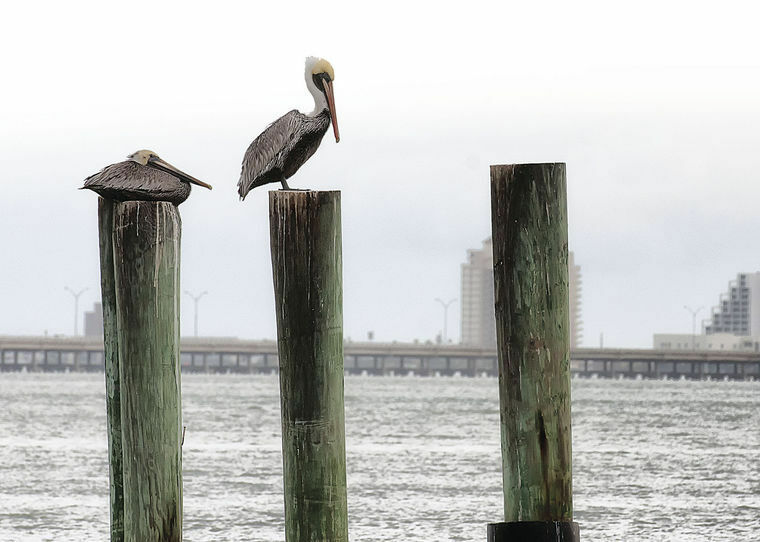 HARLINGEN — Authorities have issued an alert for motorists to watch for brown pelicans on roadways along the coast as a major cold front blows through. Low temperatures and brisk northerly winds and rain sometimes lead pelicans to land on coastal highways and bridges, especially Queen Isabella Causeway to South Padre Island and Bahia Grande/Gayman Bridge area on State Highway 48. National Weather Service forecasters noted volunteers and police also may be in or near these locations during the next couple of days and nights. Two cold fronts 10 days apart one year ago led to the deaths of between 60 and 100 brown pelicans along State Highway 48 as they sought shelter along the roadway. Forecasters urge motorists to exercise caution and slow down in these areas through this week, especially Wednesday night. The cold front is expected to begin to approach and pass through the area tonight with colder air following Wednesday into Thursday. Temperatures will drop quickly behind the cold front and will struggle to make it out of the upper 40s and low to mid-50s on Wednesday and Thursday.